Let’s face it, storage is of the utmost importance in any house with children if you want to keep chaos at bay. Yet the storage in our children’s rooms is a bit average, a tad boring and quite possibly the reason there’s never any vigorous tidying up from my kids! Thanks to our reader Brooke for bringing these groovy storage bags from Cox & Cox to our attention. One glimpse at these bags in all their printed glory and I think I may need all three! 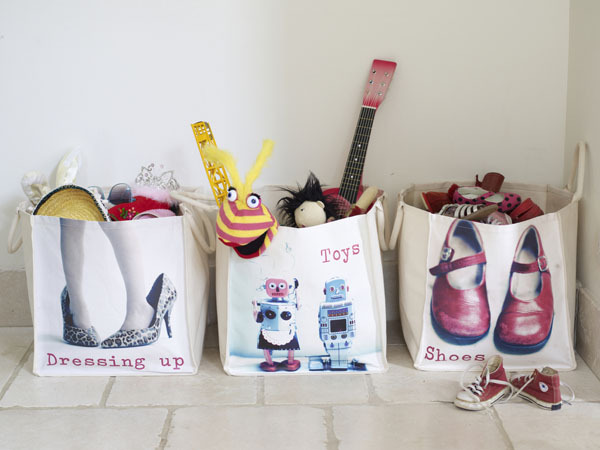 Each bag is clearly labelled with its designated contents, be it shoes, dress-ups or toys. Children who can’t read can still tidy as each bag has a fabulous image on the front. Bag are thirty-eight centimetres tall, are sturdy enough to stand up alone and are lined with plastic for easy cleaning. We mentioned Cox & Cox last year with their very cool sticker machine and a look through their website reveals a treasure trove of other fabulous finds. The storage bags are priced at £20 each with delivery to Australia available.